In 1950, astronomer Arthur Hoag discovered an odd blur of light about six hundred million light-years away in the constellation Serpens. For decades, there was a lot of conjecture about what the peculiar blur might be, but it wasn’t until the 1980s that astronomers figured out it’s some kind of unusual galaxy. Then in 2001 we finally got a good look at it in the Hubble Space Telescope photograph above. Hoag’s Object, as it’s known today, turns out to be very unusual indeed. Hoag’s Object has an inner core made up of untold billions of ancient yellow stars and an outer ring composed of much younger blue stars. Together, they’re about 120,000 light-years across, which is roughly the diameter of our own Milky Way. The core and the ring are moving through space together at nearly eight thousand miles per second. The galaxy’s core is a sphere, which in combination with the ring of stars, makes it unique among all the galaxies in the Universe we’ve imaged so far. There are a few similar Hoag-like galaxies that have elongated oval cores and ring structures, but none are this geometrically perfect. One theory about how Hoag’s Object came to be is that once upon a time the yellow core came in contact with a second, less massive, galaxy. The core galaxy’s gravity captured and tore apart the second galaxy. Then billions of new blue stars exploded into being as a result of the intense galactic interaction. Finally, these stars coalesced into the symmetrical ring we see today. All that’s extraordinary enough, but on closer inspection, Hoag’s Object becomes curiouser still. 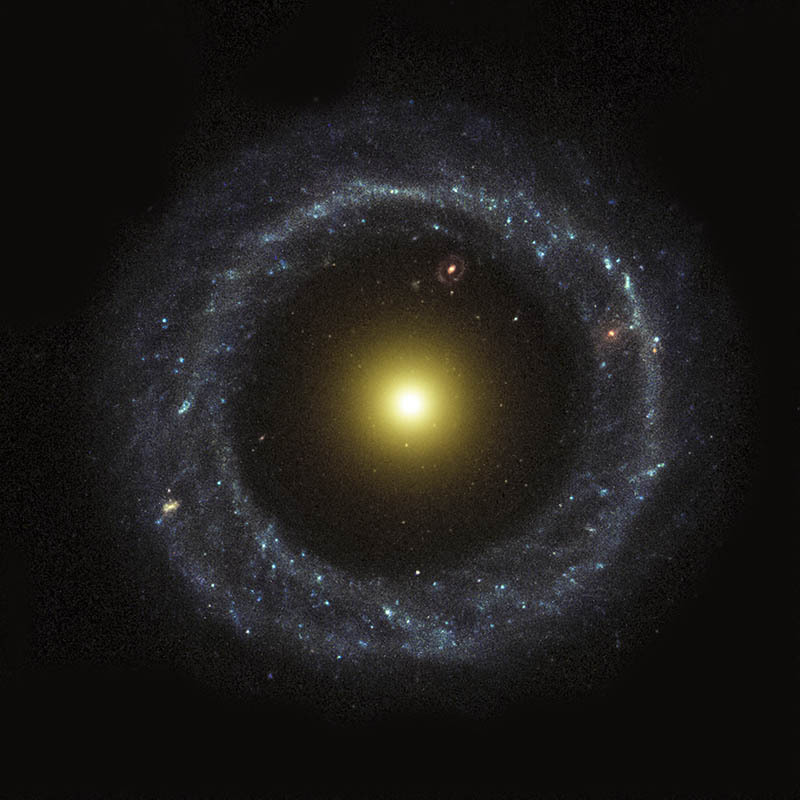 If you look at the gap between the core and the ring in the one-o’clock position, you’ll see what appears to be a second Hoag-like galaxy with nearly the same orientation in the far background . Hoag-type galaxies make up less than one thousandth of a percent of the two trillion galaxies now estimated to exist in the observable Universe, so the chances of this alignment occurring purely by chance are vanishingly small. Yet there it is. Could the structures, orientations, and positions of the two galaxies be the result of gravitational waves or quantum entanglements harmonically resonating across of millions or billions of light years? Maybe that’s a crazy thought. Then again, maybe it’s not.